"Two big scoops of flour, a heaping spoon of baking powder, half a heaping spoon of baking soda, a pinch of salt, a spoonful of sugar, a handful of poppy seeds, 3 eggs, and half a small cup of oil." My sister and I, brought up in a world where recipes were more precise and used standardized measuring devices and were written down with instructions on 3 by 5 index cards, stared at her with our mouths open until my sister came to and ran to get a pencil and paper. Even though I did not particularly care for the cookies I copied the "recipe" from my sister and carried it with me all these years. I even tried making them once, which reinforced my original opinion of them. There was nothing wrong with them; they were just . . . boring. 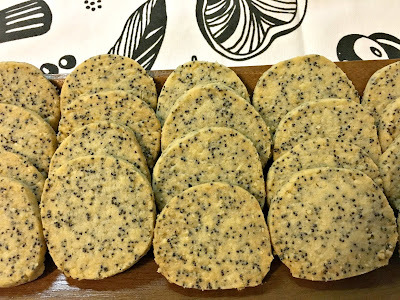 I find myself using poppy seeds regularly these days with all of my bread baking so I am always looking for ways to use the extra I always seem to have on hand. So when I ran across this recipe for poppy seeds in the Penzey's Spice catalog I decided to try them, especially since I also had ground almonds in my pantry that I was looking for ways to use. These cookies are light and delicious and melt in your mouth, thanks in a large part to the ground almonds. The almonds also add a nutty undertone that rounds out the flavor. The cookies were a big hit at work and with friends. These cookies can be made ahead of time. The logs can be refrigerated for a few days or frozen for months without affecting the texture or flavor. These days I am happy to have so many poppy seeds in my pantry. Cream the butter. Add the sugar, egg and vanilla and mix well. In a separate bowl, mix together the flour, almonds, poppy seeds, and salt. Gradually add to the butter mixture and beat well. Divide the dough in half and roll into logs. Wrap in waxed paper and chill for a few hours. Preheat oven to 325° F. Slice the logs about 1/4-inch thick and bake for about 12 minutes, or until the edges start to brown. Makes 42-50 cookies.